Reddit is the best social bookmarking and traffic website where you can up vote your links .Even Google also prefers reddit results.and it comes to top of google.Now a days it has become best medium to get easy traffic and hits. You can boost your business with High Karma and aged reddit accounts. We are selling and buying Old / Aged Reddit Accounts for advertisers. Accounts will be 2 -3 Years old with high karma. All accounts will be working and legit. You can get a lot of traffic with your reddit account.Build your audience and your social signals. Get traffic into your marketing niche and boost your business. If you're looking for a place to buy Aged Reddit Accounts with karma, established and aged, you've come to the right place. Each account would cost 10$ ( 2 -3 years old ) . Price of other accounts will depend on their age , Karma and links . Old Reddit Account now . There’s no central authority or ultimate decision maker for the Bitcoin crypto currency. Patrick Salisbury shared a post with you on Google+. Google+ makes sharing on the web more like sharing in real life. Learn more. You received this message because Patrick Salisbury shared it with vmvwiki.epost@blogger.com. Unsubscribe from these emails. A malicious Android app called Adult Player secretly took photos of people from their phone's front camera. The app's designer then demanded US $500 to destroy the photos and unlock the phone. This is an awesome technique to remember hundreds of secure passwords for all kind of accounts. Oracle doesn't want customers analyzing its code, it has contractors for that. Watches have been banned in exams at Massey University due to the adoption of smart-watches. All watches have been banned, as some smart-watches are designed to look like normal analogue watches. Smart-watches which can connect to the Internet could allow students to cheat in exams. It will be interesting to see whether this catches on at other institutions, and sheds light on the challenges wearable technology will bring in the future. 5) Can give and ask for feedback straight away. What are some of the considerations when using this technology for learning? ü Be prepared before class is scheduled, deal with everything so you don't have to leave the lecture. ü Use an USB port headphones to optimize audio you need them. List any problems you foresee and suggest possible solutions. Ø No audio – Check all plugs on your end and inform tutor you are unable to hear could be on the other side, remember to be patience. Ø No sound in recording – This is never a happy time, but should be expected to occur due to the delivery is a new technology. Ø No access to classroom – Could be down on the tutor side so no access can be granted, contact tutor straight away. Let's put an end to this low-contrast, light gray nonsense and use typography for its purpose. 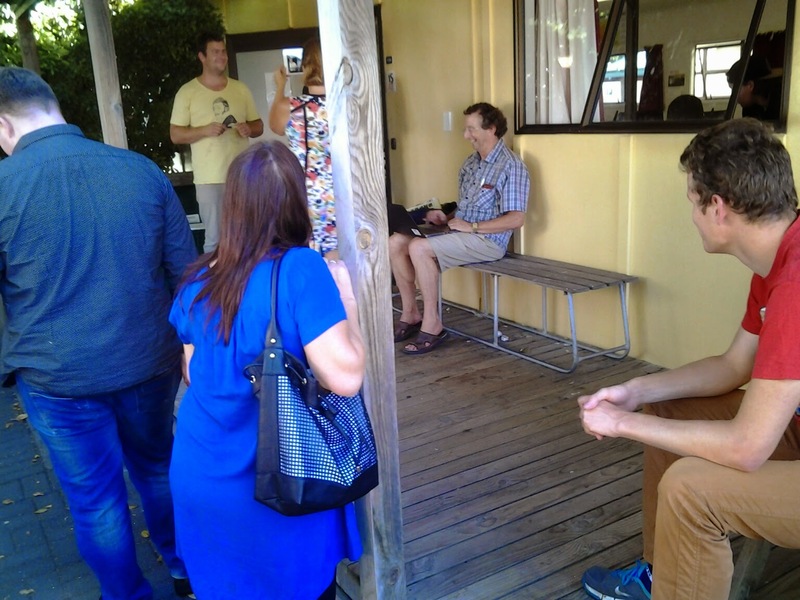 The week before the term break we had no regular DLT session but a special campus walkabout. We visited Tom who is a music lecturer at EIT. He showed us the music facilities and digital technologies he uses in this environment. For example he can access every student's computer an project the screen on the wall for everyone to see. According to him, everyone benefits from it as problems can be solved quickly and easily without walking through the room all the time. This screening software has various strengths and weaknesses. When designing learning for remote participation there are many opportunities but one has to be aware of the threats and weaknesses, too. Most modern learning technologies can enhance the learning and teaching experience, but only if used correctly. Adobe Connect for example is used regularly in the DLT class and works fairly well however it always takes some time so set everything up and if you do not have the appropriate hardware, the software's potential can not be fully used. In the DLT class the sound quality is rather bad, a better microphone or headset could easily help but is not always available. The more complex and more useful technologies go often hand in hand with higher requirements in terms of hardware and technical understanding. I am Philipp, Google name is not correct! I often use Google Docs to facilitate digital learning, its an online cloud platform that has its hooks in all of the mainstream device types like Android, Mac and PC. This online cloud platform is designed for file hosting and office productivity type activities. An example of use is working on an assignment with your peers at the same time, anytime one person makes a change to the document it is immediately saved and updated to anyone else viewing or editing the document. Collaboration capabilities, sharing work in one easy to manage place. Everyone can see whats happening easily. Easy sharing of large files. High compatibility with devices = high accessibility. Sharing is an all or nothing policy if you allow editing meaning some one could mess up the document and you have to fix it wasting time if its a regular thing. Ease of access means ease of plagiarism. Needing to have people's emails to allow them to edit. Could be used to easily give students access to a chunk of files without having to host them on EITOnline which is a very slow service. The spreadsheet function could be used to keep track of students and allow them to check off their own work in the spreadsheet, this could be used to help the student keep up and the lecturer to understand where everyone is up to. Google could take ownership of your files via some bogus terms of service. Your files could be lost. Your google account could be hacked/stolen. Considerations when using google Docs. You need to be connected to the internet to take advantage of Google Docs completely, there are apps that allow you to create documents while offline but if some one else has edited to document online while you were editing offline you can run into issues, this isnt an issue if you just stay connected. The answer to a question is available immediately. The visual medium is easy to absorb. The visual medium means people can use screen capture technology and show you how to execute a technique. If there are multiple ways of doing something and a certain video doesn’t cover a technique, you can simply find another video. Image-Line, the company that produced FL studio, have their own channel, with professional techniques and answers to many common questions. Some videos use obscure techniques and you have to research which technique to use. Some videos are of such poor quality, they are unwatchable. Image-Line could make their own playlists with quality videos only. A full FL studio visual manual (this would be quite an ambitious project but it could greatly increase FL Studios audience). YouTube may start requiring payment to have an account. Users being put off by poor quality, unhelpful videos. Users not using it because they aren't sure how to find the video they're after. Users seeking alternative video streaming sites. Finding the correct video with the easiest solution can be difficult. A user needs to consider the fact that anyone can upload an instructional video and there are some really poor videos on YouTube. Some handy tips for getting the best out of YouTube for instructional videos is to subscribe to official or professional YouTube channels as they are very reliable with their content. Another tip is to find blogs which discuss issues and techniques for FL Studio and they will often link you to a YouTube clip solving the problem. 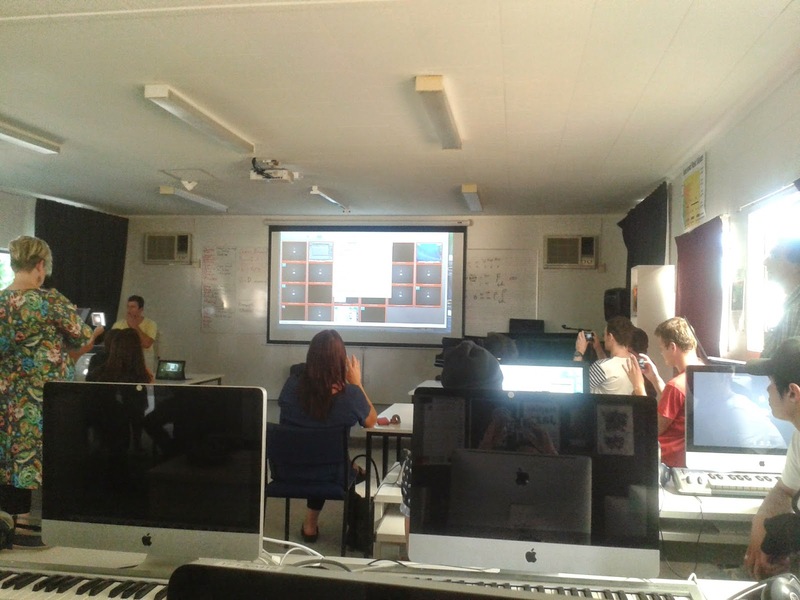 Our Digital Learning Technologies class met the music class tutor in the music lab. The class was filled with digital technologies, it had Mac computers along with music keyboards not the usual computer qwerty keyboard. The class also has a projector where Tom the music lecturer has on where he can show the students screens in front of the class. I have learn't a lot from this and how they share and collaborate, form a band and mix some music. The tutor can easily look at a students work and look at what the student is doing. Below is a couple of photos I have taken in the music lab. This photo shows the front of the room with the projector. Here is a photo of the Mac computer with the keyboard. Not all students are in class or by a computer outside of class so recording a session will be a good option. This way a student can go and watch what they missed in class or go over it again if they have memory problems. A good connection with internet is handy. If you have a slow bad internet nothing can be done at a feasible level. So a good connection is a wise choice for teaching in a digital environment. Sometimes audio/video can be a problem at either end. It is important to let each other know how to solve the issue. Again recording the session can solve the issue for the student to view again to catch what was missed. Students can reply in the chat if the issue is fixed. I added my email address as the assessment item some time ago but I'm not a contributer to your blog, http://virtualmvblogger.blogspot.co.nz/. To complete Assessed Activity 7.1 (2015), I will post to http://virtualmvblogger.blogspot.co.nz/ using Richard Ho's account. It was a great experience, we went to Music Studio with Full class of DLT. It was our "campus walkabout" tour. During the tour Tom who is the teacher of the idealschool, share with us their teaching technique. They are using “Insight” software by Faronics. It is a classroom management software. For more details about Insight please check this video. On Thursday 2nd April the DLT class began with a presentation by Charlene, an intern from the Educational Development Centre (EDC) at EIT, who covered the wide range of subject areas worked on at the EDC - e.g. Applied Science, Nursing and Teaching and the importance of knowing HTML for managing learning resources. 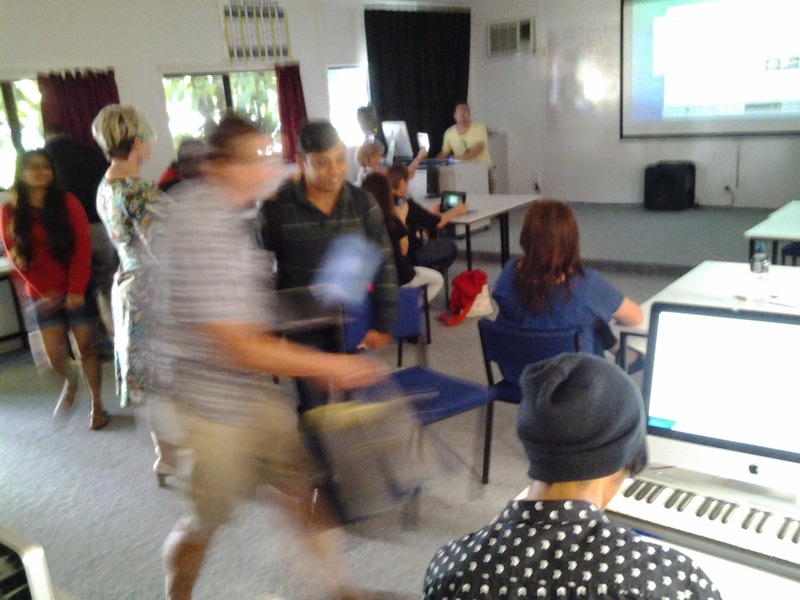 With Michael and Steph managing the technology to stream the experience to distributed students using Adobe Connect, the class went nomadic to visit the music studio at the ideaschool at EIT used by students doing the Certificate of Contemporary Music Performance. 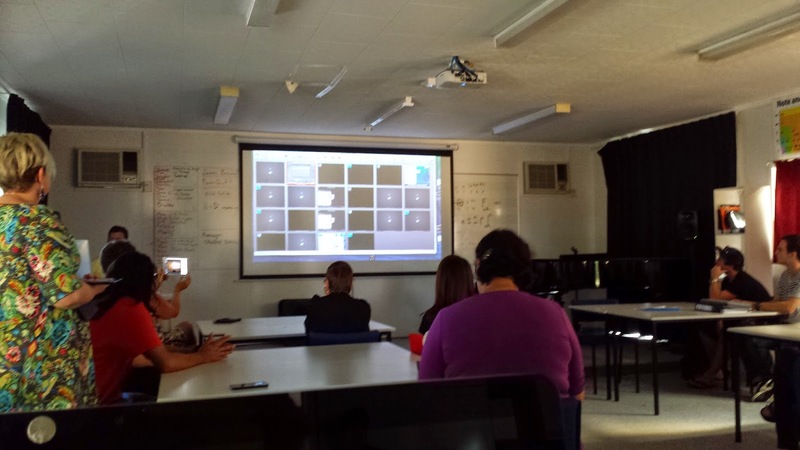 The ideaschool teacher, Tom, had a few students working on their consoles in class and generously hosted the DLT class in the studio to demonstrate the learning technology and the environment. 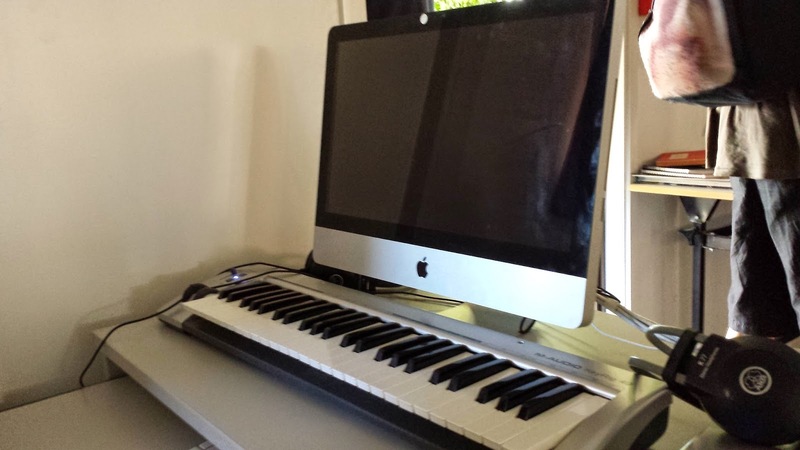 The studio is equipped with the Faronics Insight learning management system with an instructors console, large digital display screen and student workstations with electronic keyboards and Mac desktops. Faronics Insight supplies a digital collaborative learning option with electronic communication between teachers and students in addition to face-to-face communication in the studio. Teachers can instruct, help, oversee and communicate with connected students, individually or as a group, from the teacher's computer. Faronics Insight controls access to the web by students, reducing online distractions from messages, web-surfing or games. Meta Learning - Music studio and DLT in action.. Music student (foreground) on musical composition; Teacher (background) at the main Faronics Insight console with class display screen behind. BYOD invasion! The studio is set out with workstations and with separate work tables for group collaboration for composing and playing instruments. Weaknesses: costs, setup and ongoing; space requirement; possibly perceived as overly controlling and restrictive; suited to distance learning? Opportunities: develop for distance learning? Threats: security - unauthorised access and disruption. When designing learning for remote participation, the technologies, usually multiple/layers of technology (power sources, software, computers, cameras, microphones), have to be available and operational. The technologies have to work effectively for both the teacher and learner i.e. good audio and visual quality and high speed of transfer of quality information so as not to detract from the learning experience. Optional, secondary resources need to be prepared to backup and cover in the event of failure in any part of the technology chain. As well as designing course material and assessments appropriate for both face-to-face and distributed learners, the learning design and preparation needs to cover the increased demands of teaching across two channels at the same time. Preparation is required for two audiences, presented in one integrated session, with video recording for later viewing available. The time demands, workload and variables are significantly increased over a standard face to face delivery to a class, which is taxing on the teacher. The teacher must be skilled (and preferably at expert level) across all domains: pedagogy, instructional design, the subject material to be presented, the technology used for delivery and managing two audiences before, during and after delivery. Solutions to manage the workload include teaching assistance with the audience(s), technical assistance to set-up and troubleshoot the technology; administration assistance (or automation) to complete class attendance records and assistance with instructional design and implementation. During the campus walkout we visited the musical class in EIT. Their Michel introduced Tom who is tutor in EIT music department. The tom introduced some of the tools and software used by musical department and he explained the working of tools and software. The musical department is using software called insight for teaching purpose also they are using apple desktops. Every musical instrument is connected to the desktops and and these desktops are networked together. This insight software is product of “faronics”. And this is an awesome experience to become a part of campus walk out. Tutor can monitor every one activity. Can able to give individual activity. Activity done by students can able to store in insight directory. Tutor can assess the students very easily. This Software (Insight) promotes interactive learning with sharing features. Students don’t have any privacy. EIT have to Pay money for renewing the licence for this learning Software. Traditional way of learning music expense is low when compared to this digitalised way because of too much IT infrastructure and software involved. This software promotes a better participation of student in class room. Everyone can access their own activity by recording the music. An updated version of this software with new functionality will force the Organization to buy it. Because the students and tutors are more familiar with this product. Changing this familiar software will put the department in difficulty. Any weakness in this software design will cause more trouble to the users. Any way this software is good product for learning the music. Remote participation is good option for those who are not able to attend the class. In case if a student is hospitalized or taking rest in home due to illness they can attend the class through online. It is better to record the section those who failed to attend the by accident. The adobe connect is a better software for recording the teaching section. Use good hardware for better resolution and good sound for example webcam integrated with mic (microphone). Those who have poor internet connection can download the section and can watch it later.